Every workday morning I arrive at Macquarie Park railway station and take the long escalator up to street level. 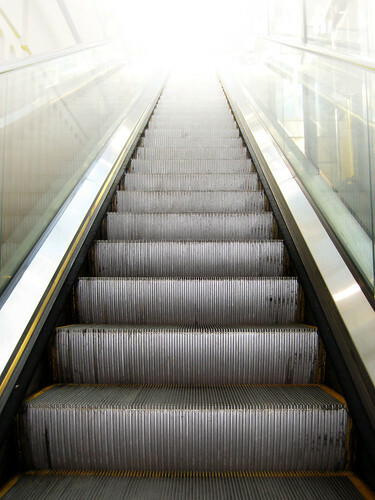 The sun was blazing outside this morning, and the impression rising out of the relatively dim underground station is of ascending to a blinding heaven. This entry was posted on Friday, 4 January, 2013 at 08:47	and is filed under Photography. You can follow any responses to this entry through the RSS 2.0 feed. You can skip to the end and leave a response. Pinging is currently not allowed. So it’s not a stairway to heaven at all! It’s an escalator.